Hundreds of Muslims gathered at the Pacific Palms Resort on Tuesday to celebrate the end of the holy month of Ramadan. Families filled the grand ballroom for morning prayers before feasting at friends’ homes. The Islamic Center of San Gabriel Valley hosted the Eid Al-Fitr event at the resort while its new mosque in Rowland Heights nears completion. The local group was able to temporarily use its new prayer hall for the first time last week. Read more in Rich Irwin’s story in Ramadan. Developer Ed Roski Jr. has talked to Industry officials about the possibility of building retail stores instead of an NFL stadium on 600 acres of open space near the junction of the 57 and 60 freeways, Mayor Dave Perez said Thursday. Perez said Roski is uncertain about whether his plans for an $800 million NFL stadium will ever come to fruition and wants a contingency in place. West Nile virus (WNV) activity has reached epidemic levels throughout Greater Los Angeles County. High levels of WNV activity in mosquito and bird populations increase the risk of disease transmission to humans. In response to this serious public health threat, the Greater Los Angeles County Vector Control District (GLACVCD) is planning to launch its second door-to-door public outreach and mosquito control campaign this week. The campaign seeks to raise awareness and extend control and surveillance operations in order to safeguard residents against mosquito bites and virus transmission. This campaign will target what District scientists have identified as ‘hotspots’ of West Nile virus activity. Diamond Bar, Hacienda Heights, Reseda and Van Nuys have been carefully selected based on their high mosquito infection rates. The comprehensive door-to-door campaign took place in Diamond Bar yesterday and from 9 a.m. to 5 p.m. today in Hacienda Heights. Staff members will be notifying residents of the West Nile virus activity in their area, providing them with instructive brochures, and offering to conduct yard inspections for mosquito breeding sources. Bilingual Spanish/English door hangers will be left at homes where in-person contact cannot be made. While community education and outreach is being escalated in areas of heightened activity, operational staff continue to deploy available resources and strategies to target mosquito populations below ground, in the underground storm drains, and above ground across the District’s diverse urban landscape. “We hope our efforts will help increase awareness in the areas at highest risk for West Nile virus transmission. But, we also want to emphasize that virus activity is prevalent all throughout the County, so residents everywhere should take proper precautions to protect themselves from mosquito bites this summer,” says Director of Community Affairs Truc Dever. The District had similar levels of high virus activity in the epidemic years of 2004 and 2008, which correlated to a high number of recorded human cases. The District hopes outreach and control efforts this year will help reduce the number of human cases of West Nile virus. The campaign is not only meant to alert residents to this year’s serious West Nile virus threat, but is also a call-to-arms for people to apply insect repellent and eliminate mosquito breeding sources around their homes. Community members and businesses are working to assist a Hacienda Heights family that lost two members in a fatal fire earlier this week. Virginia Gonzalez, 49, and her adopted 3-year-old son died in the fire, which broke out late Sunday at a home in the 1700 block of Piermont Drive, coroner’s and sheriff’s officials said. The boy’s name was not released pending positive identification, Los Angeles County Department of Coroner Chief of Operations Craig Harvey said. Both the woman and child died as a result of “smoke inhalation and thermal burns,” he said, and their deaths were ruled to be accidental. The fire was sparked by a candle left unattended in the home, sheriff’s investigators said. Gonzalez was trying to rescue the toddler when she died, officials said. Her husband was seriously injured rescuing the couple’s 9-year-old daughter. The girl’s injuries were not major. The father tried unsuccessfully to rescue his wife and son from the burning home before he was overcome by the smoke and flames, officials said. Roundtable Pizza, 17170 Colima Road, will donate a portion of proceeds from 3 to 7 p.m. today to the family, family friends said. The Hacienda Heights Pizza Co., 15239 Gale Ave. in Industry, also will donate a portion of Tuesday’s profits to the family. at Pit Stop LLC, 980 Turnbull Canyon Road, Industry. Additionally, a bank account has been set up to help the family. Those interested in contributing can donate to the Gonzalez Memorial Account, Wells Fargo account No. 8965800637. 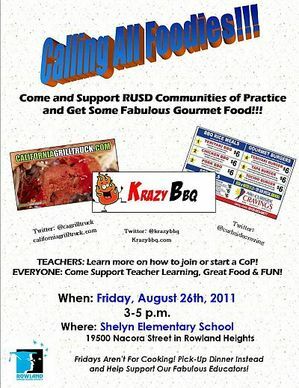 Rowland teachers are trying to raise money for educational programs by inviting food trucks to gather for a food fest at Shelyn School. Trucks include Krazy BBQ, California Grill Truck and Curbside Cravings. The fun event will be held from 3 to 5 p.m. Friday. Shelyn Elementary is at 19500 Nacora St. in Rowland Heights. Bring the whole family and an appetite. Support our schools. Many families had to break out the road maps and GPS to find their new schools in Rowland Unified School District this week. Jellick Elementary has moved to Farjardo Elementary in Rowland Heights for school modernization for this school year. Northam Elementary in La Puente has moved to La Seda Elementary. “By using our closed campuses as interim housing, we are speeding up the process and saving money,” explained Gina Ward, the district’s public information officer. Other families found their way to Telesis Academy for Science and Math in Rowland Heights. The new academy rose from the renovated remains of Rincon School. Read about the new school and administrators in Rich Irwin’s story ROWLAND. Authorities said that an unattended candle in the living room started a house fire that killed a woman and her 3-year-old son Sunday night. The woman’s husband and daughter were injured but survived the fire in the 1700 block of Piermont Drive. Pending notification of next of kin, coroner’s officials didn’t release the names of the woman or the boy. The husband saved the daughter from the flames and carried her outside, said sheriff’s Sgt. Michael Thomas in a statement. Thomas said the man returned to the house to help rescue his wife and son, but the woman ran back into the house to get the boy. “She realized her son was back in there and went for her son,” Deputy Tony Moore said. But both the woman and the child were unable to be rescued until firefighters arrived. The man and his daughter were taken to hospitals and treated for smoke inhalation, as well as for injuries the father incurred during the rescue attempt. The incident will be handled by the sheriff’s Arson/Explosives Detail as an accidental fire investigation. Observers of several faiths gathered at the nearly completed Islamic Center of San Gabriel Valley in Rowland Heights on Aug. 20 to break the month-long Islamic fasting period known as Ramadan. Hundreds of Muslims and Christians enjoyed a meal, called iftar, together at sunset to mark the end of the Muslim holy month. “It’s very heartwarming to see that many of you came from different areas to break our fast, and it means a lot to us,” Islamic Center of San Gabriel Valley President Arif Rizvi said. Dignitaries such as Rep. Gary Miller, R-Brea, and council members from Walnut and Diamond Bar joined in the celebration. Los Angeles County Sheriff Lee Baca provided a keynote address. The Islamic Center of San Gabriel Valley, 19164 E. Walnut Drive North, is undergoing a massive metamorphosis as a new 40,000-square-foot, three-story center nears completion. Tentatively scheduled to open in February or March of next year, it will replace an 8,000-square-foot facility the center has been using for nearly 30 years, Islamic center Secretary Ashraf Jakvani said. Read more in Brian Day’s story Mosque. Find pictures of the orientation at Mesa. Cindy Singer is a county librarian at the Hacienda Heights branch and she’s worried about our public libraries. That’s why she wrote us this letter. “As a Los Angeles County librarian, I am concerned that the trend of library privatization comes with a risk to our library quality as well as our collective pocketbook. “When mega-bookstores wiped out so many mom-and-pop booksellers, consumers were left with fewer choices when it came to finding specialty books or receiving quality customer service. I worry that libraries under private control will cater solely to popular demand rather than manage resources well so everyone in our community has access to quality informational material. “Similarly, communities with privately controlled libraries have seen professional library staff replaced with less qualified employees who don’t have experience running successful library programs. In one library, a once-fully developed reading program has been reduced to handing kids coloring sheets. “Because we are focused on a public service mission, our local libraries endeavor to understand and fulfill the particular needs in our communities. In my library, that means providing critical support to local children and families, enabling them to learn about and connect to resources they can get in our community, such as speech therapy and early literacy. Without AB 438 in place, we can’t be assured that a private library, driven by corporate headquarters’ formulas, won’t sacrifice these community services for the sake of corporate profit. “The trend toward privatization comes as the economy continues to falter and quality library services are more important than ever. Every day, we see people looking for information for things they’ve never done before: fixing their own car, doing repairs around the house, growing a vegetable garden, learning another language. Read more of Singer’s letter at Library.